Looking at the 2015 CMA Awards nominations as a collective whole, you can easily make the argument that in some categories, the cup runneth over — and in others, not so much. The nominees for entertainer of the year include Garth Brooks, Luke Bryan, Kenny Chesney, Eric Church, and Miranda Lambert, but noticeably missing from the crop are Jason Aldean and Blake Shelton. While the argument for the latter might be that Shelton didn’t tour that much as he was busy with The Voice, he did tally nods for male vocalist and vocal event. In the case of Aldean getting off the list, it may just be a situation of too many nominees with compelling arguments for inclusion. He did at least net an album of the year nod for Old Boots, New Dirt. The male vocalist of the year category gets even more interesting. Bryan, Church and Shelton go head to head with Dierks Bentley and Chris Stapleton. But, you could easily make cases for four or five other male acts, including Aldean. Taking a look at the female vocalist of the year category, the voters freshen things up some with Kelsea Ballerini, as well a giving a nod to Lee Ann Womack’s dynamic The Way I’m Livin’ disc – but truth be told, both artists (as well as the critically beloved Kasey Musgraves) are basically just holding a spot in the category as the race continues to be between Lambert and Carrie Underwood – with Lambert likely to claim her sixth straight win in the field. Speaking of Underwood, it’s a little mystifying that she didn’t earn a single of the year nod for “Something in the Water.” The record was somewhat controversial because of its Christian tone, but it still was one of the biggest hits during the year – and one of her best performances. 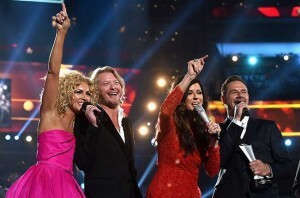 It was no surprise that the name of Little Big Town was called repeatedly during the nomination announcements on Wednesday morning. “Girl Crush” was definitely one of the most-talked about (and most-played) records during the year, and will be a likely favorite in both the single and song of the year categories. One interesting trend this year: The CMA recognized the accomplishments of newcomers, with Sam Hunt, Maddie & Tae, and Stapleton all picking up a trio of nominations each. The first two have seen undeniable success while mining different styles of the format, and Stapleton (up for new artist of the year, album of the year for Traveller and male vocalist of the year) has become the male version of Musgraves – a ton of critical acclaim but no significant airplay. As far as other surprises, the Zac Brown Band were nominated for vocal group of the year, but surprisingly didn’t figure into more categories with their musically diverse Jekyll & Hyde. Randy Houser, one of country music’s most under-appreciated singers, picked up a nomination for song of the year for “Like A Cowboy,” and for all the talk about the lack of female vocalists in country music, one category that does merit mentioning is video of the year. Musgraves, Maddie and Tae, Little Big Town, Lambert and Underwood are the contenders: Take away Jimi Westbrook and Phillip Sweet from Little Big Town and it’s an all-female crowd. Hopefully, this is a trend of something to follow. In all, it’s potentially shaping up to be a huge night for Little Big Town – as well as for Lambert – who could very well become the first woman to win the entertainer of the year trophy since Taylor Swift . Brooks and Chesney will likely cancel each other out with the veteran votes, and Bryan and Church being on the same label might split some, though Bryan is still the obvious favorite. For the eighth consecutive year, Underwood and Brad Paisley will co-host the CMA Awards when it airs live from Nashville’s Bridgestone Arena on Nov. 4 at 8 p.m. ET. For the full list of nominees, click here.